The second concert I ever attended was Alice Cooper, on the Raise Your Fist and Yell tour. I was thirteen years old. I wasn’t at that time a fan of Alice Cooper, but I was familiar enough with the theatrics of his work to know that I wanted to see him when the show came to town. I convinced my parents to take my friend Devin and me. I remember being nervous around all of the large, black-clad fans milling around before the show. I remember being scared of the guy down the row from me smoking a joint. I remember the opening act, Frehley’s Comet, led by former KISS lead guitarist Ace Frehley. I remember only some of Cooper’s on-stage fright show, but I do remember enjoying it. I don’t remember any of the music. 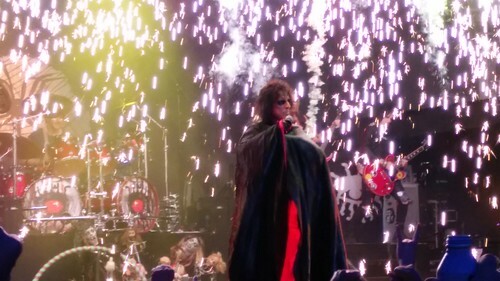 That concert made me an Alice Cooper fan, though, and I’ve enjoyed his works ever since. I’ve enjoyed his various cameos, and I’ve long wished for an opportunity to see him perform live again. That desire came true last night. 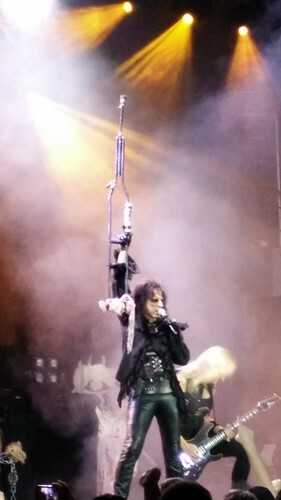 There was no opening act, so the concert was two solid hours of Alice Cooper performing some of his greatest hits. The show opened with Vincent Price’s monologue for “The Black Widow”, and then the first part of that song was played before transitioning to another song I unfortunately didn’t know. There were only two songs in the whole evening with which I had no familiarity. 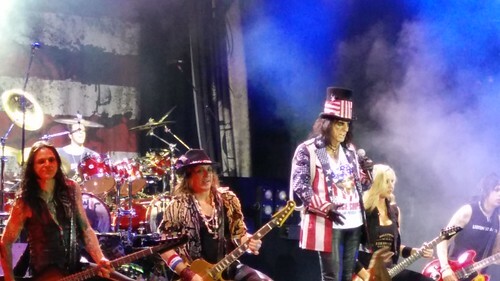 “Under My Wheels” was played very early in the evening, as was “Billion Dollar Babies”. A few songs I didn’t expect made it into the lineup, including “Is It My Body,” “Poison,” and “Cold Ethyl”. And of course there were theatrics. 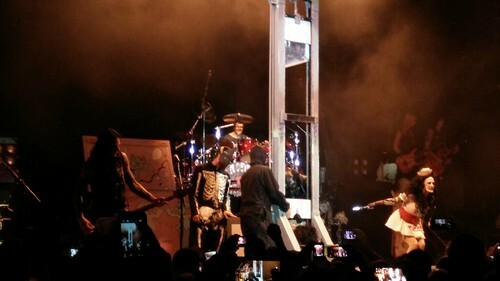 There were plenty of electric sparks, scary characters, a live snake, a 12’ tall monster running around the stage, and the guillotine, which severed Cooper’s head and shot blood out onto the audience. The band was great, and full of energy. They were every bit the showmen that Cooper was, making for a great show to watch as well as to listen. Cooper didn’t run around the stage, and he wasn’t screaming his vocals out. He gave a solid, enduring performance and knew, from years of experience, exactly how to work the crowd. I had a grin on my face the entire time because I was having so much fun. The audience was as interesting as the show. A lot of aging rockers, many of them worse for the wear. There weren’t too many teens, but there were a surprising number of adolescents and family groups. It was nice to see parents taking their kids to the show. Everyone that I saw appeared to be having as much fun as I was. The band played four tributes to departed rock heroes, one song each from Keith Moon, Jim Morrison, Jimi Hendrix, and David Bowie. All four songs were beautifully performed, and the crowd ate it up. The band closed with “Eighteen”, and did a single encore of “Elected”. During the song, Cooper introduced “the candidates” and two performers in Trump and Clinton masks came out and monkeyed around for a bit. This was the only part of the show I didn’t like. It wasn’t an overtly political statement, but I felt it was a distraction from what I came to watch. It was clownish and silly, and not in the same tone as the rest of the theatrics of the show. 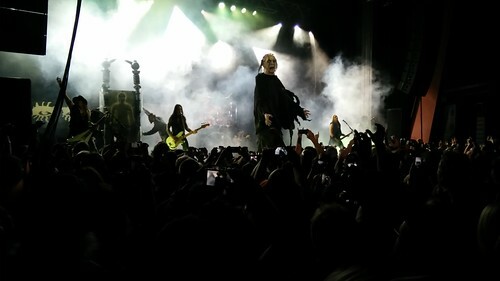 Like the first time I saw Alice Cooper, there were still plenty of large, black-clad fans. And there were a lot of people smoking joints. I kept looking to see a wide-eyed teenager experiencing his second concert, but that kid never showed up.